Bentley's rolled out the new Continental GT in both coupe and convertible forms. So what's next? The four-door, that's what. Though it doesn't wear the same name anymore, the Flying Spur is, for all intents and purposes, the sedan version of the Continental – and, with the exception of the old-school Mulsanne, the oldest member of the company's lineup. Fortunately Bentley is preparing to introduce an all-new version, and has dropped these initial teaser images and a brief video clip to go with it and give us a little hint at what to expect. 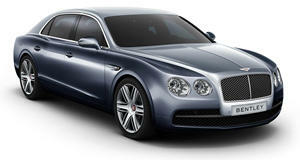 Reviving a name that goes back decades into the British marque's history, Bentley launched the first modern Continental Flying Spur in 2006, and a restyled version (dropping the Continental name) in 2013. So despite the mid-cycle refresh, the current model is essentially 15 years old by now, which is an eternity in the context of automotive life-cycles. The good news is that the new model is slated to drop sometime later this year. The bad news, for the time being, is that the teasers give us little to go on, showing only a silhouette and more chiseled bodywork leading from the grille and retractable hood ornament. We can, however, expect the new Flying Spur to draw heavily on the advancements wrought by the new Continental GT (as well as the Bentayga crossover), and come underpinned by the same MSB platform that Porsche developed for the latest Panamera. Power is anticipated to come from the new version of Bentley's 6.0-liter twin-turbo W12, driving all four wheels though an eight-speed automatic transmission – with V8 and potentially hybrid versions to follow as well. The 48-volt electrical system will power the suspension, and a lighter curb weight ought to make it handle even better. But we'll just have to stay tuned to find out more.